This policy imparts minimal stylistic consistency guidelines and provides some guidance on the legal and procedural nuances of communicating on the World Wide Web. These guidelines address "official home pages" and "other official pages." This document also contains some guidelines and useful suggestions for all pages published by members of the Laurier community. These guidelines are intended to augment, not replace, the "Ethical Principles in the use of computers at Wilfrid Laurier University" and the "ONet Membership Terms and Conditions." The information providers for the Laurier Web pages will be the University departments and other recognized University groups. In addition, academic groups with a Laurier sponsor may receive permission to be an information provider at the discretion of the Office of Computing and Communication Services. There will be no personal home pages, or links to personal home pages on the Laurier Web site. Professionally related home pages such as curriculum vitae for faculty, position descriptions for staff, and resumes for students are at the sponsoring department's discretion. For the purpose of this Policy, an "official home page" is a single page that introduces an organizational unit of the University and provides links to more detailed information about the unit. Official home pages are included in the index that appears on the Laurier home page. A. In order to ensure some degree of continuity, maintain a consistent image, and increase usage of information electronically published by Wilfrid Laurier University, the Office of University Advancement reserves the right to monitor and review the official home pages. B. Each official home page will have a standard Laurier navigation bar across the top and a standard navigation bar down the left. The side navigation bar is to be generated dynamically using a server-side include. The navigation bars are included as part of the official templates for Laurier home pages. The templates can be obtained by contacting Laurier's Public Affairs Department. C. Each official home page will contain some type of general description of the unit or a link to a page with same. Sources may include the Wilfrid Laurier University Facts and Figures brochure, the Undergraduate Calendar, the Graduate Calendar, etc. D. Each official home page will contain an e-mail contact address for the unit's page manager who is responsible for the accuracy of the information contained in the unit's page(s). E. Information on each official home page will be kept up-to-date, and each official home page will show the date last modified. F. Each unit creating an official home page is responsible for ensuring the information contained therein is of the highest editorial standards (spelling, punctuation, grammar, style, etc.) and factually accurate. If errors are observed, you will be contacted by University Advancement and asked to make corrections. G. The following statement shall be included in full on each official home page. "Although care has been taken in preparing information contained in this document, Wilfrid Laurier University does not and cannot guarantee the accuracy thereof. Individuals using the information do so at their own risk and shall be deemed to indemnify Wilfrid Laurier University from any and all injury or damage arising from such use." The above statement is included in the Laurier home page template. H. An official home page should not contain images larger than 100kb. Page managers should consider that the speed of loading images averages 2kb per second. I. Use of programming techniques which would limit the accessibility of the official home page to specific browser versions or specific browsers is discouraged. If problems are observed, you will be contacted by University Advancement and asked to make corrections. Pages related in any way to the programs of the University and its units may also be considered "official pages" and should therefore include some or all of the following elements when it is reasonable, practical and appropriate to do so. A. A link back to a higher level page. B. An e-mail contact address or a link to a page with same. D. A disclaimer similar to that required for official home pages. The University recognizes the impossibility of reviewing any and all information published electronically by members of the Laurier community and, therefore, will not do so. It is strongly encouraged that faculty, staff and students who have a professional page, are sponsoring an authorized academic organization, or are representing an authorized Laurier affiliated organization, include the following elements. A. The following disclaimer applies, in effect, to all pages that are not official but which carry a Laurier network address. This should appear on pages that are not official, or be otherwise reasonably apparent to anyone viewing such pages: "This page is not a publication of Wilfrid Laurier University and Wilfrid Laurier University has not edited or examined the content. The author(s) of the page are solely responsible for the content." B. The e-mail address of the author, or other person responsible for placing the information on the World Wide Web, shall be readily apparent for each such page via information on the page, a link to another page, or the context. C. Any pages discovered that are in violation of the Policies in this document shall be subject to immediate removal by Computing and Communication Services at the request of the Office of University Advancement. A. The preferred names for the University are "Wilfrid Laurier University" or "Laurier." "Laurier" may only be used if the University's full name appears at least once on the page. Use of other names such as "WLU" is discouraged. B. Authors or originators using trademarks should have express permission of the person(s) or organization(s) owning the trademarks prior to their use. 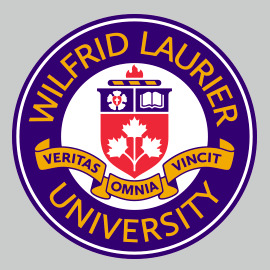 C. Use of any Wilfrid Laurier University logo or trademark must be sanctioned by the Office of University Advancement. Page managers should be familiar with the Wilfrid Laurier University Graphics Standards Manual. In case of doubt, requests for pre-approval may be sent to the Office of University Advancement. D. Authors or originators using photographs, images and audio clips need the permission of the person or organization that owns the photograph, image or audio clip. E. Any use of other copyrighted material must have the express written permission of the person or organization that owns the copyright. The Office of University Advancement reserves the right to require proof of the written permission and to remove the material if that proof cannot be produced. F. The content of all pages must not violate or constitute a copyright or trademark infringement and must not violate any local, provincial or federal laws. G. All pages must comply with all appropriate Wilfrid Laurier University policies and procedures, including the "Ethical Principles In the Use of Computers at Wilfrid Laurier University" and the "ONet Membership Terms and Conditions." Any World Wide Web resource that makes excessive use of network bandwidth may be terminated in accordance with these policies. For the convenience of those initially setting up an official home page, a number of templates have been provided that meet the requirements of this policy. Please note that these templates are subject to change. The templates can be obtained by contacting Laurier's Public Affairs Department.